Showing results for tags 'Ponyville'. It's been a while since Swift Squall was in the Castle of Friendship. Various commitment and obligations always got in the way fro another visit, preventing Squall from dropping to say 'Hi' to his Sweetheart or asking the Princess Sparkle for opinion on some important matters. Unfortunately, his presence here this evening was once again dictated by duty. There was something made Swift spent his nights sleepless lately, and for the welfare of Equestria and beyond it had to be addressed.... "Sorry to drop by so unexpectedly Dear....." Swift apologized to his fiancee while they stood in the Castle's main hall - now illuminated by the pale light of the moon. Princess Sparkle was away right now. For how long? Who knows? It didn't wasn't really relevant right now - especially seeing that he had to exchange words with her as well, regarding the same issue. "I just felt.....that this place is more secure then most. And Saraneighvo....Well, Saraneighvo isn't really an option, is it?" he said, almost sounding apologetic to the crimson pegasus. "......I am not sure who else will come. I tried to reach out to however many I could yet....." he paused for a moment, before taking a deep breath. Noblepony turned around and gazed at the Fire. "....You agree with me, do you? At least on the part that the current course can't continue?" he asked, almost hesitant. Having contemplated seeing the sights around equestria outside of his home in the Velvet strand, Lockhart Thunder walked down the path out of his beloved home village. It felt a little bit strange for him, and he worried about being away from his herd. Lockhart had always dreamed of traveling around equestria, But he was always to fearful to leave his herd, anxious that something might befall of them while he is gone. Having talked about it for a long time to his Dear Autumn, She and a few other close Peryton finally managed to convince him that the herd would be just fine, and that a few other younger bucks were willing to fill his place for awhile, and that he should takes some time to relax and enjoy it. Having crossed the lakes, Lockhart headed down past Cloudsdale and into Ponyville. Trying to put the anxiousness of being away behind him The winged deer trotted over a hill looking over Ponyville. Stopping to rest for a moment on the path he gazed upon the town below. Looking in amazement at all the houses around. The Pony kinds homes where much different from that of his homeland which where all simple underground homes dug out of the hillside. These on the other hand where all above ground structures, with various features and designs. Some being more intricate than the other. Something that was totally new to someone with simple tastes like his kind. Walking into town Lockhart looked around at all the things to see. It was so much more busier than at home. Taking it all in The large winged deer trotted down the dirt paved street through town, a sweet smell trailing behind him. His magic was much weaker alone, but was still prevalent around him. As he wandered around looking for something to get into, he noticed all the ponies going about their business, and walking the streets like him. Lockhart had been used to being around ponies as his homeland was much visited by their kind for the Peryton's magic, But this felt different. Back home he was around his fellow Peryton. He was however the only one of his kind here, He felt out of place, exposed, He felt like he stuck out among all the other ponies and could be easily spotted from afar. Even being a large Peryton, Lockhart couldn't shake the thought in the back of his mind that he was vulnerable, and exposed. Taking a deep breath in and exhaling out, Lockhart tried to put his mind off of it as continued down the street gazing into the windows of shops as he passed by hoping to find something to occupy his mind and help him relax a little. Perhaps maybe he should visit one of the baked goods shops around to see what kind of cuisine the ponies liked. Lockhart thought to himself as he searched around for such a shop. he gave a bit of a nervous chuckle thinking about all the looks he might get walking into a shop. He knew the Peryton didn't get out much, and he figured it would come as a surprise to ponies to see one of his kind in Ponyville. He almost wandered if he was drawing attention even now, as he let his surrounding slip from his view as he searched for a shop to visit. Something that he wasn't much used to. It was a nice warm sunny day in Ponyville, just like most of their days, the sun beating down in a gentle golden beam across the wide streets of the quaint town, ponies wandering back and forth, attending to their businesses or their general needs, the food places filling their outside seating on a day like today, while many establishments had their doors open to let the cool air through their buildings. One such building was a rather large one, a combination of a quaint home, with a bookstore bolted onto the front, what made this special however was the stock; filled with first and only editions of some of the rarest and oldest tomes in Equestria and from beyond its borders, one could easily get lost between the shelves of the impressive range, no labels on the shelving units, but it was all organised in a way that only the store owner seemed to know about. On the topic of the owner, he was stood behind the tall oak counter in the store, wearing a rather nice pinstripe suit jacket on his grey body, his mane short and cut in a formal way that may have been trendy a few years back, on his front left hoof was a rather fancy and most likely expensive watch, and what was even stranger about him was his age, looking like a moderately young stallion, not the sort to run such a large store on something that would look at home in a grandparent's attic, and yet here he was, hard at work as always, the ever peculiar Coltson, so happy to be living with so little risk in his life. Roads, Tempest has seen plenty of them in her life and walked far too many alone in her youth. Yet here she was walking a road she took many years ago to a town she last saw as a runaway in passing. She did not remember ponyville with much clarity do to how long it has been and her age at the time but what few things she did remember were hardly the same. The town has changed a lot in that time… Some more tall and ugly than others but Twilight's dreadful taste in homes was not her place to judge… But if she lived here she may have to plant a tree or two to cover that eyesore up. But regardless of that atrocity she needed to rest. Maybe not in the form of laying around but more mentally. Being alone left her… Alone with her thoughts and after a few days of that she concluded that was NOT a good idea for her at the moment with the turmoil raging inside of her. How will others feel if they knew the truth? Yes in many ways she was lied to and lead astray… But in other ways she did much of it willingly and even enjoyed it. Reflecting on this was troubling as her time alone gave her plenty of time to dig deep into herself and what she was learning was only making it more… unpleasant. She enjoyed, no, she loved the power she had. With a sigh she pushed her dark thoughts away as best she can and looked to the town she was passing… around. She did not feel ready to just walk in to it, it was far too close to Canterlot. They all must have known what she did and will ask to many things she does not wish to be asked about yet as deep down she did not know how to answer them. Guiding her eyes to the countryside she saw the clear layout of a farm. 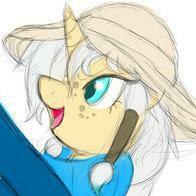 She remembered that farm, she stole apples from it way back when… Apples… That one with the hat, Applejack was it? She said something about living in ponyville. Was this her farm? Maybe it can giver her the shelter she needed and offer some work as well. Farmers were ever in need of an extra pair of hooves after all and many were not tro shy to take on passing ponies for short bost to pony power. So maybe this Applejack will help. She was a friend of Twilights and seeing as Twilight insisted that she and her were friends… Well, friend of a friend helps a friend? That was how that saying worked… maybe. Whatever it may be She made her way to the farm with the midday sun glittering on the black steel of her armor and undersuit. She has… been hesitant to remove it. She can’t explain why but she felt very vulnerable for now and it supplied her some feeling of familiarity, comfort… Pride. Approaching the gate that marking the entryway to the farm she stopped and looked over the home and farmland before her… Forgotten memories glimmer before her like broken glass on the floor. Hiding, rain, stealing an apple to eat before pushing on. She flicked her ears and closed her eyes as remembered her life as a filly. So young and alone, what if she just… stayed here? Maybe they’d have adopted her? It was pointless to think about yet it lasted longer than she wanted it to. With a frustrated snort of anger she opens her eyes and walked past the gate and into the farm itself. “HELLO!? Eanypony around! ?” She yelled out, hoping they were not busy and she was not being to bothersome. @tacobob ------- Sweet Apple Acres was a big place. Aside from the number of orchards they had, from reds, to greens and even Zap Apples having their own patch: theirs was a land built on the backs of their ancestors who had first settled Ponyville. It t’weren’t no small operation. It was up to them to provide food for all the ponies settling here and so as more and more came to settle more orchards were planted. Sweet Apple Acres came to be more than just the acres originally settled. That meant there was a whole lot of work to do. The work fell squarely on the shoulders of the Apples and their kin to tend the fields. The spring was finally here. Thanks to Twilight being in charge of the planning for the committee Winter Wrap-up went by faster letting them sow seeds sooner. Though it meant starting work earlier, something Mac was at odds at. He liked keeping busy and maintaining the barn was a regular chore, upkeep with the fields seasonal, but it was a full time jo and Mac here liked taking naps on occasion. His sister was more the workaholic where as he was responsible so stealing away for naps in a pile of hay wasn't much a surprise for his kin to spot. Today was such a day. With lunch abiding the red apple a well deserved break he decided to just take a moment to collect himself. It was in that moment he was leaving the barn. Shaking out his boss the substantially built Apple would loose hay from his fur, catching a straw between his lips before he let out a snort. Reaching up he'd give a good brush of his honeysuckle colored mane to ensure any and all evidence of his leisure was dusted away. Starshine's pink mane fluttered in the wind at the train stop. Using a simple levitation spell, Star carried her suitcases off of the platform she arrived at. Tucked away in her suitcase was an invitation to the animal shelter in Ponyville. Just thinking about the animals that were waiting for her made Star giddy. She couldn't wait to take care of them! The light breeze that carried through her mane, causing it to lightly flick her face, reminded her that she needed to focus. Star had only ever been in Ponyville a couple of times, mostly on the outskirts, and would need to be observant if she was going to find the shelter. Starshine began trodding through the streets of Ponyville. All around her were buildings of different shapes and sizes, some were curvy and ornate, others rectangular and formal. Overall Ponyville was a diverse place, so it was no surprise that the building themselves were unique. Star scanned her area, she recognized the fields where she had helped during Winter Wrap-Up awhile ago, but that was really it, aside from the obvious landmarks. It took Starshine another twenty minutes before she finally asked somepony for directions. The mare gave her exact directions, before hurrying along. It took Star not even three minutes to find what she was looking for. Star, upon seeing her destination wheeled her suitcase behind her, packed with supplies, at an increased speed to reach the shelter. Once she had walked inside, Star wasn't exactly sure what she was supposed to look for. The invitation hadn't really told her which pony she should talk to, so Star stood there, a confused look on her face. As far as she could tell, nopony seemed to aware of her presence, and nopony seemed to recognize her as their guest... Was there a specific pony that she was supposed to meet? Had she arrived too late? Too early? She released the levitation spell on her suitcase handle. She unzipped it and pulled out her invitation, and then rezipped it. She left it floating in front of her as she reread. It was always a rare chance to spread her wings, and escape the chains of her lofty position. The pristine Canterlot castle was steadily shrinking behind her, and overhead, the sky was slowly developing an orange tint to the blue as the sun slowly began its descent towards the horizon. Being awake before the sunset was the earliest time she'd risen thus far, and although she enjoyed her sleep, a period in which she could peacefully rest, her restlessness had been growing lately. It'd been far too long since she'd gotten out of the castle, and not for an event that required the presence of a princess to oversee it. It was about time that she tried to pursue something that she missed: the freedom she once had those thousand years ago before her fall. When she could freely explore the Everfree Forest with Melvin, and spend what time she could wrangle out of her sister.. before she'd begun to get shrugged off more and more in favor of ponies. Her blue wings were spread wide, beating every so often to keep her aloft as she flew towards a location that was semi-familiar to her. It wasn't terribly far from Canterlot, thankfully, but even still she needed the exercise. Being cooped up in a castle most of the time didn't often give her the chance or the reason to fly, and flying was one of her favorite things to do. It was.. freeing. All of her worries and stress were simply swept away. Princess Luna wasn't sure what she would do once she reached Ponyville, or if she would simply fly past it in favor of the Everfree Forest. Hopefully, around this time, there wouldn't be as many ponies on the streets with the onset of the setting sun; she didn't want to make a scene by suddenly dropping in. Even now, Luna knew how much the ponies favored the princesses for the crowns they wore and the protection they offered, almost to the point that a glimpse of them in public was enough to excite the citizens. Luna didn't want to get swarmed by them when she still had something of an aversion to crowds and the noise they brought with them. Her starry mane fluttered, streaming back from her head as she descended towards the steadily approaching country town, and the closer she got to it, the more she began to pick out more notable buildings outside of the tall Town Hall as her teal eyes searched for a quiet, empty street to touch down in. She wasn't sure if it would truly be empty, or who she might run into on this little, spur-of-the-moment visit to break outside of her repetitive schedule. It'd been a matter of some months of traveling south into Equestria on hoof before he found anything of interest. It would have been faster if there was another form of transportation, but Sombra had not yet learned of the train- he had only ever seen the odd tracks of wood and metal, crossed during part of his travels. Equestria, Sombra came to notice, was terribly bright and sunny, made up of great swaths of untouched wilderness with pockets of civilization. The first place he finally stumbled upon was a lively, sprawling town. The architecture of the buildings and the material that made them up looked entirely alien to Sombra's eyes, having only ever seen the Crystal Empire. Pale walls, wood trim, and yellow straw-thatched roofing. The ponies, on the other hoof, were nothing new; the only difference was that they didn't have the shine that the crystal ponies had. They were bright and pastel, but dull. Dull, like him. It might've been a nice change, if the mere sight of ponies hadn't set him on edge. It was after some quiet backpedaling that Sombra decided to skirt the edge of the town, wandering in between the scattered buildings and studying what he could see thus far without drawing attention to himself. Or so he believed. It was still, entirely possible that ponies had seen him, and some no doubt still saw him, lurking on the edges like a wolf watching a flock of sheep. For the first time in a very, very long time, King Sombra found himself at an utter loss of what to do. He was still weak. No throne, no crown, and no position of power. He couldn't take what he needed by force, and not in Equestria- if the royal sisters got wind that he still lived, they'd certainly come after him. The thought of being locked away again in some other manner of prison by their hooves filled him with fear, and he hated it. After Sombra had gotten to see a little of this town of ponies, he withdrew towards the dark forest that seemed to border part of it. Having no knowledge of what it was or its history, the only thing that he saw in it was temporary refuge. A place to linger until he had some sort of idea, some sort of plan, on how he would deal with entering this town. If anypony dared follow, he might not see them; he was too wrapped up in his own thoughts, for the moment. @SteelEagle To say Scootaloo was nervous would be understating it. It'd been pretty anxiety inducing, approaching Rainbow to ask about the upcoming Sisterhooves Social - mainly because the two of them never participated in it together before. Still, she managed to buck it up for the time being and ask. Scootaloo thought that might be the end of it; once Rainbow said yes to it (which she did, thank Celestia), then Scootaloo would have a merry ole' time and the two of them would blow away the competition once the actual Sisterhooves Social came round. Scootaloo even remembered being excited at the time once Rainbow agreed and arranged a place and a time for the two of them to meet to prepare for it. The little pony had been counting the days down as they came by, and now that it's finally happening... ...that's when the doubts decided to make themselves known. Here Scootaloo sat, at the spot that Rainbow herself established for the two of them, and if she wore any she'd be quaking in her boots. Some nervous chattering of her teeth and shuffling of her hooves later, and she managed to suppress the butterflies running rampant within her stomach enough to look the part of the confident pony. To be fair, the image was pretty practiced at this point, so it was easy to slip into; but it did nothing to actually quell the worries that came floating by. After all, as luck would have it, this was when her thoughts decided to crash upon her, setting her into a state of supreme unease. What if I'm not cool enough? What if I get hurt? What if she gets hurt? What if I get her hurt? What if I mess up the routine and she'll never wanna see me again? The doubts became so prevalent that they were practically paralyzing, and it took her attempting to observe a tree in the fields to refocus herself. She swallowed thickly, straightened her sitting position, and hoped to the sun above that Rainbow would get here soon. Surely she'd start feel better once the rainbow-maned pegasus appeared to put all of her fears to rest. That was, of course, assuming she'd actually show up. "Where is she?" Scootaloo muttered to herself, agitation growing. Okay, so she was here early, but still! Surely Rainbow wouldn't ditch on her... Right? The sun was beaming down upon Ponyville, showing the town in all its glory from the shadows cast by the charming thatched buildings to the reflected beams of light from the titanic crystal tree that was the home of the Princess of Friendship, however another building was now influencing the light, positioned on the other side of the lake that sat next to Twilight's castle was the School of Friendship, a charming building that took inspiration both from the quaint townhouses, and the bold colours and spires of the castle it shared a lake with. The school was bustling with activity as it always was on a school day when classes were starting to wrap up. Within the school, one of the more unique students was quickly walking towards the exit, not quite happy with being caught up in the crowd, it would be hard to know she was not a pony; she certainly looked like one at current, with yellow fur and a blueish mane with a ladybug cutie mark. However this pony was not as she seemed, for starters she was a changeling, the only changeling attending the school, having been sent there by Thorax to study friendship and it's values as a gesture of good faith to the princess running the school. Once outside again, Ocellus lets her guard down, changing back into her real form, with her teal body and translucent pink mane. She carefully wanders through town, exploring every little detail as she also keeps an eye out for any more book shops. The mostly quiet town of Ponyville was as quiet as it normally was; it was the kind of place which lived in opposites; one day you could be relaxing at the cafe enjoying a nice hay sandwich, the next the cafe could have been flattened by the newest creature to escape the Everfree Forest. And yet ponies seemed to rebuild and carry on as normal; this was the Ponyville way, to carry on and only question it when in the company of good friends for a nice laugh. It certainly helped Coltson do both of his jobs well; nopony ever questioned how the bookstore was always left standing after such attacks or even how a store like it could stay in business when the owner had such a penchant for holding onto the valuable books; it was just the way things worked with him. It did confuse some ponies however on how the pony who ran the store almost always wore a suit and sunglasses at work when inside, however most passed it off as just another quirk from the young businesscolt. And today was a day just as any other for him; he relaxed at his counter, eating a hay sandwich he had picked up from the cafe for lunch, the sun was out and rain wasn't scheduled for another few days, so he had his door wide open, allowing the golden rays to spread across the shop floor, causing the embossed spines of the books to shine with colour, especially from the ones with foil emboss. There hadn't been many customers today; most just stopped by for a chat or to catch up with the colt, it was as pleasant and boring as you could get. Cold Snap! A Helping Hoof! OPEN!!!! Boulder Dash took a deep breath of crisp sir as he trotted through Ponyville with his saddle bags and a small sleigh behind him with a shovel and other tools on it. Though Winter Wrap Up was still being planned, Boulder Dash had volunteered at a local meeting to get a jump start on things by clearing areas most frequently used by Fillie and the elderly. Always willing to help his friends and neighbors, especially after befriending he Princess of Friendship herself, Boulder was always happy to lend a helping hand with his great strength. Looking at the Town Hall as he passed it he pulled a letter out of his saddle bag and began reading it as other Ponies around him went about their day. Dear Boulder Dash, On behalf of the Ponies of Ponyville, I wish to thank you for your help today and say how grateful we are to have you back home and for your volunteer work today. Below is a list of spots to clear today as requested by our citizens and businesses. Once again thank you for your help and please stop by my office if you have any questions. Yours Gratefully, Mayor Mare Boulder Dash smiled and made his way to his first stop, The Ponyville School Building. As he approached he recalled his own days attending the school when he was a filly himself. He waved to the young fillies as some went into the School to get warm while a few stayed outside to watch the large Earth Stallion work. Approaching a large oak near the school playground Boulder Dash saw it was still covered in snow that was slowly melting. Smirking he walked over to the tree, adjusting his hat, and cracked his thick neck. He then smashed his head into the tree causing it to rattle and shook as if hit with a Boulder or a large club, and then all the snow fell from the tree into the ground. The Fillies watching cheered and a few stamped thier hoofs approvingly. Boulder Dash bowed like a play wright to them, only to be hit on the head by a last plop of snow on the tree. "Whoa!" he shouted as the snow hit him, causing a few Fillies to chortle and laugh loudly. She felt the rumbling of the train start to slowly decelerate as she woke up from her short nap. Normal ponies probably wouldn't be able to notice the slight change at that point, but her passive heightened senses made it more obvious. The trip from Ponyville to Canterlot was long based on the fact that traversing up a mountain isn't easy for a train to do, so the most straightforward path wasn't the safest. She could almost feel her hometown within reach. She was going to miss this town when she leaves again eventually, but she couldn't just stay in this town forever. "Hey Ejaz, wake up. We're basically there," She said to the pony next to her before getting up herself. "Welcome to the most peacefully dangerous town in Equestria," She announced after the stallion awoke. "The train should be stopping any moment now and you don't want to miss this." She felt the train stop and the train's whistle announcing the arrival. She stepped off the train rushing off the platform momentarily forgetting about Ejaz, before stopping and heading back to him. "We're heading to my house first, I think it's too late to do anything else unless you want to take a detour for whatever reason." The day was just starting for many citizens of Ponyville, the sun raising up overhead just enough to peek through the closed curtains of most ponyfolk, the day as pleasant as it always was when rain wasn't scheduled. The small town glistened in the light, not least of which the castle of the Alicorn Princess of Friendship, certainly a place for one to visit on holiday, the crystalline structure performing well in its job to look nothing like the rest of the town it was in, highlighting it as the abode of an important figure. For Lens however, the day was not just starting; he had been wondering the streets of Ponyville all night and was now enjoying the warmth of the sun as he continued his laps. Work had been drying up recently for the colt, and unless he came across a major case soon; he was at great risk of losing the little shack that he called both his office, and his home. An even worse thought for the colt was that once that was lost, really there was nothing cheaper than it except to sleep on the streets. So he had started travelling out further in search of a big time case that could save his career and his home, a search that today had him staking out every street in Ponyville, waiting for something important to stumble across him. Coltson was happy, that was an easy statement to make on most days of the week. The pony happily standing behind the counter of his bookstore in Ponyville as he started analyzing the cover of a new book that had came in, the spine adorned with all kinds of rare jewels, and the writing on the cover embossed in gold leaf, it was a thing of beauty in all certainty, however he seemed more interesting in the subtle printing on the front, the writing outlandishly plain compared to the rest of the front, a feature that interested him greatly as he calmly smiles as he studies the writing, which appeared to be horn writing from the way it was tilted. He opens the cover with great caution, looking like he feared the book may just disintegrate in front of him. "Okay, most definitely Pegasi origin from the interior writing and cover emboss." he notes to himself as he keeps reading through its pages. The midday sun sat high in the sky above the pleasant town of Ponyville, ponies coming and going in the usual cheery way that Ponyville seemed to inspire in others, perhaps it was the fresh open air, or the quaint little shops lining the main street; or the giant crystal palace of the Princess of Friendship, which was probably partly to do with it. Though just because everypony else wandered around with a smile, doesn't mean that Lensblot would, and indeed he did not. He hated jobs in Ponyville; everypony just tried to be too helpful, despite not knowing the intricate nature of his work; couldn't go five feet without somepony attempting to make friends, and that annoyed Lensblot to no end as a pony who preferred to decide on who his friends should be, rather than having some crazy pony bounce into his face and declare it. Nonetheless; he had just finished a case, albeit an annoyingly circular case, the cycle was over now as he pondered on what to do next; it was a little early to head back to Los Pegasus, but he also had no intention of doing a castle tour or the like, so instead he busied himself doing what he loved most; exploring, dipping in and out of the roads and alleys, looking through each kind of shop he could find, and what secrets were hidden away in the dark. He pushed his sunglasses back up his nose as he eventually comes to what seemed to be some kind of ice cream shop; deciding that this would probably be the cheapest place to get quick food to provide energy to get back home, he quickly nipped inside, strolling towards the counter as his tail sways from side to side, his face still resting with a slightly annoyed expression. It goes like this: One town meeting in Ponyville. One spirit of chaos. One heated discussion on the value of foals. And just a dash of the regular Ponyville madness. Suffice it to say, the town meeting does not adjourn on a high note. In fact, most everyone ends on a low night - about foal height, to be exact. Luckily, not everyone succumbs to the heated debate, leaving a few still capable of keeping order. Which is good, because when a town assembly suddenly becomes the target of a chaotic prank, order is the best tool to maintain. Doesn't mean it's the easiest, though. ---------- Welcome to the "Adults get turned into a bunch of little foals" RP sign-up! A town meeting is being held in Ponyville to talk about (insert hand-wavey excuse here), and several ponies have gathered to listen to the discussions and participate. However, when Discord shows up and starts arguing the benefit of foals with another, things take a nosedive into chaos and instability. You know, regular day in Ponyville. Right up to and including Discord changing a bunch of adults into foals to prove his point. Adults who are transformed into foals (roughly the cutie mark crusader stage, with no cutie marks) lose all memory of their lives past that age - both their bodies and their minds revert back to foal age. So while none of them will remember ever setting up their businesses or joining the military or getting married, they will all remember going to school the 'previous' day or eating breakfast 'just that morning' with their parents. If you're interested, sign up below! Sign ups are open, but depending on how many people are interested we might install a cut-off point. Ideally we'll have a good ratio of foals to adults in the thread, but if you're really interested in playing a certain role then go ahead and sign up. We'll work something out! Adults - Applejack (SteelEagle) - Presteza (Pretzelparty) - Fire Walker (tacobob) Adults turned Foals - Inkbrand (Zeig) - Dunder (Dunder) - Diamond Dust (PyroBlaze) - Prince Blueblood (PrinceBlueblood) - Squall (Ciraxis) - Naj (DerpRavaner) - Bluemoon (DreamySunday) Update: Thread is now live!